Telluride, CO – To a first-time visitor, Telluride brings to mind many things, including remoteness, steepness …and wealth. It’s the playground of the rich, the new Aspen. Daryl Hannah owns a house here. The singer Jewel was recently interviewed by a local magazine about living here. According to locals, Oprah Winfrey just bought a $17 million house here that she could stay in while awaiting completion of an even more expensive home down the road. But Telluride is something else as well. Despite the influx of money, which fuels an industry where an on-mountain lunch café sells $18 soups and $40 entrées to an eager crowd, there still exists a sense of community that has been lost at many other resorts. It’s a place where most lifties are still true ski bums, with long hair and thick beards, instead of college students from Peru. It’s a place where a ski tuning shop closes at around lunchtime for two hours every day so its owner can ride, a place where locals leave items in a “free box” on the street for anyone to take. Many resorts brag about how their town is a state of mind, not a place; Telluride seems to have taken that concept to heart. By want of its location, it really couldn’t be any other way. 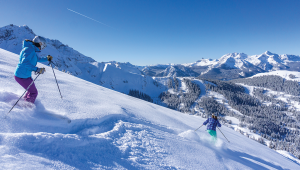 It’s certainly one of the most remote among Colorado’s major ski resorts, located in the state’s southwestern corner 65 miles from Montrose, the nearest major airport with commercial service (although limited flights into Telluride’s own lofty airstrip will resume this winter). It’s well over 300 miles from Denver. The town itself is located in a box canyon, a narrow cul-de-sac with a flat valley floor and thousand-foot high walls on three sides. Bridal Veil Falls – a scenic attraction in summer and one of the nation’s most difficult multi-pitch ice climbs in winter – is at the head of the valley. Free cross-country ski trails traverse the valley floor, making a pleasant alternative to downhill skiing for an afternoon. The town itself was founded in 1878 for mining, as were most Colorado ski towns, and some say that the town’s name comes from the phrase “To hell you ride!” as miners pushed off into tunnels on ore carts. 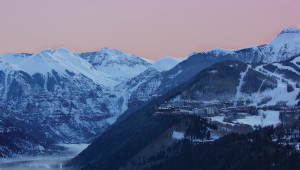 Today, Telluride is home to about 2,300 year-round residents. The ski resort began operating in 1972, and immediately drew ski bums who clashed culturally with the remaining mining families. For years, it was a secret ski nirvana – locals still talk about the days when they could live, practically for free, in an old miner’s shack without running water or even heat. These days, you have to look real hard to find unimproved housing. The smallest of these charming miner’s cottages now sell for more than $1 million, and rental properties for employees are not easy to find. The town’s music and arts festivals, golf and skiing, hiking and mountain-biking attract tens of thousands of tourists in all seasons. The ski resort itself is tough to describe. The actual base area of Mountain Village is located on a high shelf to the west of town, although ski trails also descend steeply to Telluride proper. 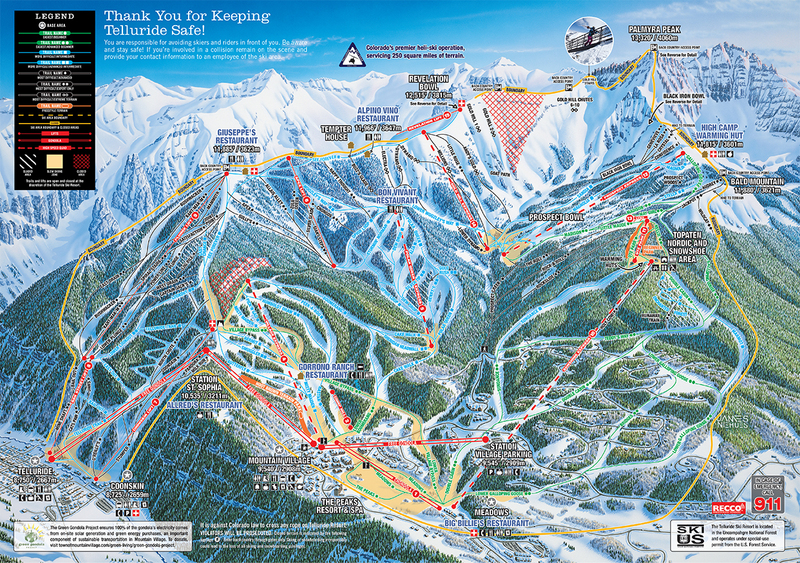 The resort is made up of a series of connected ridges and peaks, including many gullies and couloirs that scream down from a ridgetop. 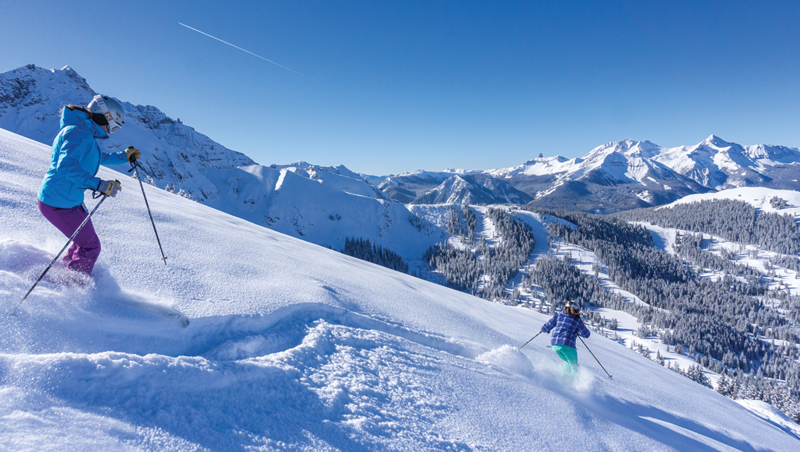 But despite Telluride’s fearsome reputation for expert terrain, the mountain has plenty of groomed beginner and intermediate cruisers to choose from as well. I arrived here on a Tuesday evening, pulling up to my slopeside hotel, the Mountain Lodge. I was planning to spend one night here, in high-end splendor, and another night at the Angler Inn, a $100-per-night hotel about 15 minutes down the road. My one-bedroom condo at the Lodge included a well-appointed kitchen and living room, with a balcony and fireplace. Room rates range from about $300 and up per night, with some discounts available through AAA and other programs. I had just come from a day of technical climbing a nearby ice route known as Ames Ice Hose, and I was so tired that I abandoned a plan to visit the nearby outdoor hot tub as there was a Jacuzzi tub in my room that would do just fine. I was about to jump in when I glanced out the window and saw the sunset. There was so much red in the sky, I couldn’t stay put. Exhaustion be damned, I grabbed my camera and ran onto nearby ski slope to take pictures (yes, I re-dressed first!). Telluride’s scenery does that to you. Once restored, I decided to wander down to town. Given Telluride’s topography, though, this wasn’t as simple as it sounded. I had to walk across a ski slope to a nearby parking garage, ride two elevators to the top floor, and get on a short gondola to the base area. 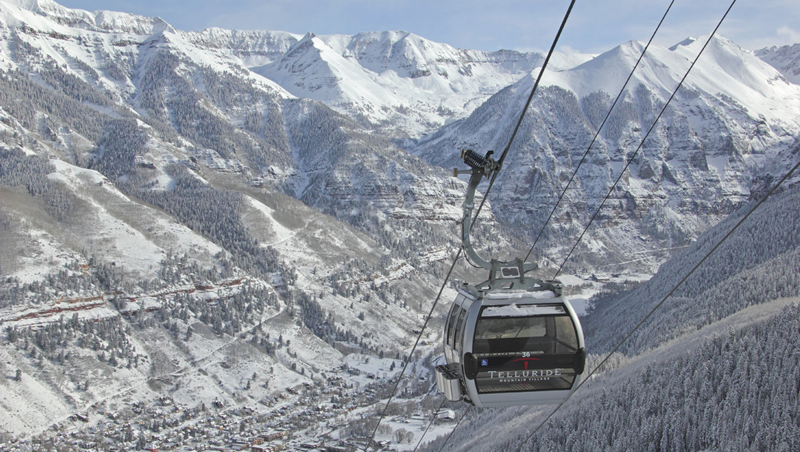 From there, a second gondola — the free public transportation linking Mountain Village with Telluride that’s celebrating its 20th anniversary this season — took me up and over a 10,500-foot high ridge and down the other side to Telluride. By now it was fully dark and chilly on the 20-minute ride (I later learned that blankets are available). Rising up and over the ridge was incredible – the lights of Telluride, almost straight below, were mesmerizing. At the top of the ridge is one of the resort’s signature restaurants, Allred’s, which is certainly worth the price of dining for its stellar views, especially at sunset. I arrived in town at around 8 p.m., but things were pretty quiet. There were a few groups of skiers wandering around, and some of the pubs were busy enough, but mostly there wasn’t much happening. Telluride is clearly no Aspen or Vail when it comes to nightlife. I investigated a grocery store, taking note of a $7 liter of ginger ale (I don’t care how good it is, there’s simply no reason to ever spend that much on a bottle of soda), before settling on a brie burger at a local pub. I enjoyed my $15 burger while looking through some of the half-dozen free glossy magazines published in town, all of which were filled with fine writing and top-notch photography. Clearly, the need for advertising high-end real estate has been very good for the publishing industry here. By 10 p.m., I was ready to head back home. While the action in a few of the bars was picking up, I had reason to not linger as the gondola only runs until midnight. I later asked a local what would happen if I missed the last ride back to my hotel. “After fueling up with a bagel and egg sandwich from a nearby grocery store the following morning, I rode the Village Express to start exploring the mountain by riding the blue runs in the early morning sun. From there I climbed higher, to the resort’s 12,000-foot high ridge where I sampled some steeper terrain. It had been two days since the resort last received four to six inches of snow – the first snow in nearly a month – and conditions, while not superb, were certainly better than they had been following the atypical drought that afflicted much of February 2016. 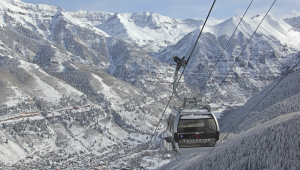 Telluride has 127 trails and 18 lifts, with 40 percent advanced terrain. There’s a total vertical drop of 4,400 feet. With a base at 8,700 feet and a summit that tops out at over 13,000, this not the best place to travel to directly from sea level. Revelation Bowl is a highlight, and a good place for a skier like me who skis some advanced runs but was feeling a bit rusty. The bowl contains a series of single-black runs, including some corniced entries for those feeling springy. A day after the storm, there was still powder to be had, although it was going quickly. After playing here for a few runs, I wandered over to Bald Mountain and its stellar view of Telluride’s many summits, topped off by 13,320-foot Palmyra Peak. There’s double-black skiing that spills down nearly every peak in sight, most of which would be considered extreme. From the top of Palmyra – accessible via a hike of about an hour – there’s even more terrain accessible through a backcountry gate into Bear Creek. For those with the big bucks, heli-skiing is also available. Thanks to thin and icy conditions during my visit, most of the really steep stuff was closed, but there were still plenty of challenges to be found. Over at Prospect Bowl, skiers by the dozen were carrying their skis to explore the bowl’s single-black runs. But I wandered to the other side of the ridge, skiing down to to the town of Telluride. Here is where I got into trouble, finding bulletproof moguls on the innocuous-sounding Milk Run. 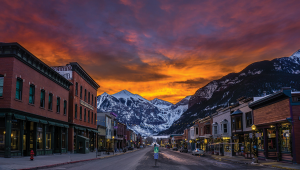 Over on skier’s far left, most of Telluride’s easier terrain is bunched together around the resort’s growing million-dollar ski home community, which climbs way, way up the mountain’s lower flanks. If you ride the Sunshine Express with locals, they can point out which ones belong to famous people. It’s fun to ride down these easy trails, gaping at these stone and glass mansions. While you probably won’t ever own a place like that, at Telluride you can at least eat like a rich person. This resort, like some others around the nation, has embraced the European style and quality of on-mountain dining. Skiers can visit such on-mountain cafés like Alpino Vino and Bon Vivant to lunch on rich continental cuisine with prices to match. There are few things finer than enjoying an al fresco meal washed down with a Belgian ale on a sunny, warm Colorado afternoon. Judging by the crowds doing the same, many skiers apparently agree. With food like that, it’s tempting to linger. But then again, don’t, as there’s a lot of Telluride to explore. It may be best to save the extended meal for after you’re done for the day. That is, assuming that you still have the energy.